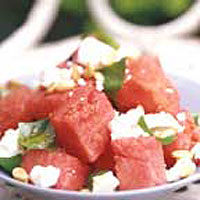 The marriage of cool, crunchy watermelon with sharp yet creamy Feta results in a stunningly simple, delicious dish. Cut the melon into large wedges and cut away the skin. Cut the melon into 2.5cm chunks. Arrange these in a dish and then crumble the feta over the top. Scatter over the pine nuts. Tear the basil leaves roughly and add these, then drizzle over the olive oil. Season with pepper (you shouldn't need any extra salt as the feta is very salty). Serve alone as a starter or as a salad alongside chicken or fish.